Born in England, George Turnbull was a naturalized American citizen who served his country in both World War II and the Korean War. He then became a high honor graduate from the renowned College of Fine Arts of Carnegie Mellon University, and later earned a Master of Fine Arts Painting degree from the University of Southern California. He became an award winning graphic designer and an international award winning calligrapher. 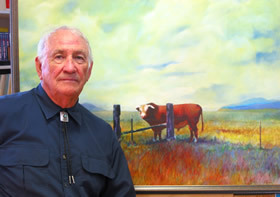 Granted the title of Professor Emeritus, Turnbull retired from a long and distinguished career as Professor of Visual Communications in the California State University system and eagerly returned to his passion for Fine Art painting, particularly of the American west he knew so well as a young man. His work is a rich reflection of a great variety of unique life experiences and abundant talent. In addition to military service which took him literally around the world, Turnbull spent many good years living and working in California and the western states. He was always intensely aware of the visual imagery and color in those surroundings. That awareness served him well. His work can be seen in many notable Invitation Only shows. 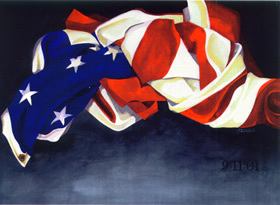 His paintings and Fine Art prints hang in many prestigious public places such as the George H. Bush Presidential Museum in Texas where a print of his highly acclaimed watercolor painting, titled "9:11:01," is part of that museum's permanent collection. Equally proficient in watercolor and oils, Turnbull's considerable talent found honest expression in a wide range of subject matter. Striking still lifes, rich rural scenes from his northern California ranch area and broad western landscapes... all have a quiet, thoughtful strength that wears well. His favorite geographical focus was the Great Basin of the western United States, that part of the west where the cowboys known as Buckaroos still work and ride. He believed the life and livelihood of the Great Basin Buckaroo is particularly well suited to his lyrical use of color and direct compositional style. Turnbull had always been drawn to the beauty of the Great Basin's geography, with its high plains, vast open acreage, spectacular mountains, dry summers and hard winters. George Turnbull's paintings reflect his respect for both the land and those whose lives it tests. To visit the Turnbull Gallery at the ranch, call 530-988-5758.